With miles of turquoise water and pearly sand stretching out behind it, The Betsy – South Beach sits snugly at the heart of Miami Beach, surrounded by city parks, gardens, golf courses, and waterways. Easily accessible by car, it's no more than a 40-minute drive from any of the three airports in the area. In a market awash with chain hotels and cookie cutter style, The Betsy stands out as proudly family owned and independently operated. The hotel has been a fixture on Collins Avenue for 75 years, and bears the fruits of a recent merging with the historic Carlton Hotel. The result is a 130 key Art Deco gem with lots to love. The Betsy’s Ocean Decks are expansive with sweeping views of Miami and the Atlantic, offering a rooftop pool, wellness garden with a full range of spa treatments, and sunrise yoga. 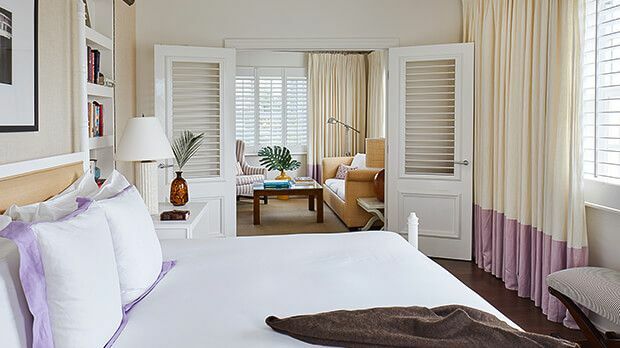 Each of the hotel’s rooms and suites offer private, beachside havens that combine sensory detail and inspiring design for a unique South Beach experience. Features include plantation-style shutters, dark walnut flooring, original artworks and Thassos marble bathrooms with Malin+Goetz amenities. Beyond the accommodations, guests can experience two restaurants, several event spaces and a sprawling rooftop deck with swimming pool. LT Steak & Seafood helms the dining component, with Chef Laurent Tourondel serving a seasonally inspired menu of surf and turf. There’s also The Alley, a trattoria-style Italian restaurant specializing in pizza with unique toppings inspired by the local landscape. Send an availability request with your requested dates to the The Betsy – South Beach.